that found in most oscilloscopes. It is also possible to define a win- Firmware Option Block Average dow mode, with two trigger levels, that enables triggering when The Block Average Module im- signals enter or exit the window. Each input has its own trigger cir- proves the fidelity of noisy re- cuit which can be used to setup conditional triggers based on logi- petitive signals. Multiple cal AND/OR patterns. All trigger modes can be combined with a repetitive acquisitions with re-arming mode for accurate trigger recognition even on noisy sig- very small dead-time are accu- nals. mulated and averaged. Ran- dom noise is reduced by the External trigger input averaging process improving All boards can be triggered using up to two external analog or dig- the visibility of the repetitive signal. The complete averaging pro- ital signals. One external trigger input has two analog comparators cess is done inside the FPGA of the digitizer generating no CPU that can define an edge or window trigger, a hysteresis trigger or load at all. The amount of data is greatly decreased as well as the a rearm trigger. The other input has one comparator that can be needed transfer bandwidth is heavily reduced. used for standard edge and level triggers. Please see separate data sheet for details on the firmware option. Multiple Recording The Multiple Recording Firmware Option Block Statistics (Peak Detect) mode allows the recording of The Block Statistics and Peak several trigger events with an Detect Module implements a extremely short re-arming widely used data analysis and time. The hardware doesn’t reduction technology in hard- need to be restarted in be- ware. Each block is scanned tween. The on-board memory is divided in several segments of the for minimum and maximum same size. Each of them is filled with data if a trigger event occurs. peak and a summary includ- Pre- and posttrigger of the segments can be programmed. The num- ing minimum, maximum, aver- ber of acquired segments is only limited by the used memory and age, timestamps and position information is stored in memory. The is unlimited when using FIFO mode. complete averaging process is done inside the FPGA of the digitiz- er generating no CPU load at all. The amount of data is greatly de- Gated Sampling creased as well as the needed transfer bandwidth is heavily reduced. The Gated Sampling mode allows data recording con- Please see separate data sheet for details on the firmware option. trolled by an external gate signal. Data is only record- ed if the gate signal has a External clock input and output programmed level. In addi- Using a dedicated connector a sampling clock can be fed in from tion a pre-area before start an external system. Additionally it’s also possible to output the in- of the gate signal as well as a post area after end of the gate signal ternally used sampling clock on a separate connector to synchro- can be acquired. The number of gate segments is only limited by nize external equipment to this clock. the used memory and is unlimited when using FIFO mode. Reference clock ABA mode The option to use a precise The ABA mode com- external reference clock bines slow continuous (normally 10 MHz) is nec- data recording with fast essary to synchronize the acquisition on trigger instrument for high-quality events. The ABA mode measurements with external equipment (like a signal source). It’s works like a slow data also possible to enhance the quality of the sampling clock in this logger combined with a way. The driver automatically generates the requested sampling fast digitizer. The exact clock from the fed in reference clock. position of the trigger events is stored as timestamps in an extra memory. PXIe bus The PXI Express bus (PCI Express eXtension for instrumentation) of- Timestamp fers a variety of additional normed possibilities for synchronising The timestamp function different components in one system. It is posible to connect several writes the time positions of Spectrum cards with each other as well as to connect a Spectrum the trigger events in an extra card with cards of other manufacturers. memory. The timestamps are relative to the start of record- PXI reference clock ing, a defined zero time, ex- The card is able to use the 100 MHz low-jitter reference clock that ternally synchronized to a radio clock, an IRIG-B a GPS receiver. is supplied by the PXIe system. Enabled by software the PXIe refer- Using the external synchronization gives a precise time relation for ence clock is fed into the on-board PLL. This feature allows the cards acquisitions of systems on different locations. to run with a fixed phase relation. PXI trigger The Spectrum cards support star trigger as well as the PXI trigger bus. Using a simple software commend one or more trigger lines can be used as trigger source. This feature allows the easy setup of OR connected triggers from different cards. External Amplifiers For the acquisition of extreme- ly small voltage levels with a high bandwidth a series of ex- ternal amplifiers is available. Each of the one channel am- plifiers is working with a fixed input impedance and allows - depending on the bandwidth - to select different amplifica- tion levels between x10 (20 dB) up to x1000 (60 dB). Us- ing the external amplifiers of the SPA series voltage levels in the uV and mV area can be acquired. Order Information The card is delivered with 4 GSample on-board memory and supports standard acquisition (Scope), FIFO acquisition (streaming), Multiple Recording, Gated Sampling, ABA mode and Timestamps. Operating system drivers for Windows/Linux 32 bit and 64 bit, examples for C/C++, LabVIEW (Windows), MATLAB (Windows and Linux), LabWindows/CVI, IVI, .NET, Delphi, Java, Python and a Base license of the oscilloscope software SBench 6 are included. Drivers for other 3rd party products like VEE or DASYLab may be available on request. Adapter cables are not included. Please order separately! PXI Express x4 Order no. Bandwidth Standard mem 1 channel 2 channels 4 channels M4x.2210-x4 500 MHz 4 GSample 1.25 GS/s M4x.2211-x4 500 MHz 4 GSample 1.25 GS/s 1.25 GS/s M4x.2212-x4 500 MHz 4 GSample 1.25 GS/s 1.25 GS/s 1.25 GS/s M4x.2220-x4 1.5 GHz 4 GSample 2.5 GS/s M4x.2223-x4 1.5 GHz 4 GSample 2.5 GS/s 1.25 GS/s M4x.2221-x4 1.5 GHz 4 GSample 2.5 GS/s 2.5 GS/s M4x.2230-x4 1.5 GHz 4 GSample 5 GS/s M4x.2233-x4 1.5 GHz 4 GSample 5 GS/s 2.5 GS/s M4x.2234-x4 1.5 GHz 4 GSample 5 GS/s 2.5 GS/s 1.25 GS/s Options Order no. Option M4i.22xx-ir40m Low voltage input range option for 22xx series. 4 Input ranges with ±40 mV, ±100 mV, ±200 mV, ±500 mV, bandwidth limited. Firmware Options Order no. Option M4i.xxxx--spavg Signal Processing Firmware Option: Block Average (later firmware - upgrade available) M4i.xxxx-spstat Signal Processing Firmware Option: Block Statistics/Peak Detect (later firmware - upgrade available) Services Order no. Recal Recalibration at Spectrum incl. calibration protocol Standard Cables Order no. for Connections Length to BNC male to BNC female to SMA male to SMA female to SMB female Analog/Clock-In/Trig-In 80 cm Cab-3mA-9m-80 Cab-3mA-9f-80 Analog/Clock-In/Trig-In 200 cm Cab-3mA-9m-200 Cab-3mA-9f-200 Probes (short) 5 cm Cab-3mA-9f-5 Clk-Out/Trig-Out/Extra 80 cm Cab-1m-9m-80 Cab-1m-9f-80 Cab-1m-3mA-80 Cab-1m-3fA-80 Cab-1m-3f-80 Clk-Out/Trig-Out/Extra 200 cm Cab-1m-9m-200 Cab-1m-9f200 Cab-1m-3mA-200 Cab-1m-3fA-200 Cab-1m-3f-200 Information The standard adapter cables are based on RG174 cables and have a nominal attenuation of 0.3 dB/m at 100 MHz and 0.5 dB/m at 250 MHz. For high speed signals we recommend the low loss cables series CHF Low Loss Cables Order No. Option CHF-3mA-3mA-200 Low loss cables SMA male to SMA male 200 cm CHF-3mA-9m-200 Low loss cables SMA male to BNC male 200 cm Information The low loss adapter cables are based on MF141 cables and have an attenuation of 0.3 dB/m at 500 MHz and 0.5 dB/m at 1.5 GHz. They are recommended for signal frequencies of 200 MHz and above. Amplifiers Order no. 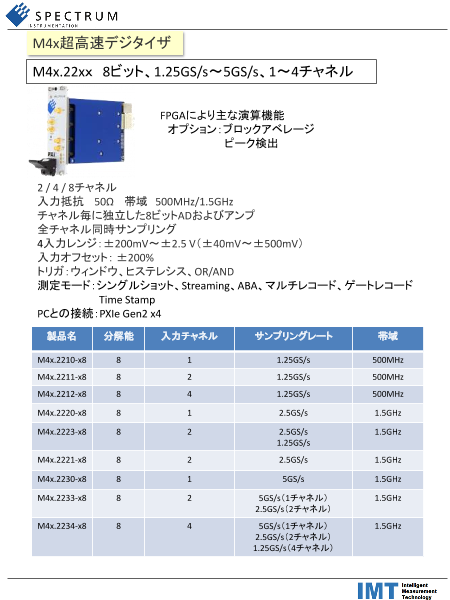 Bandwidth Connection Input Impedance Coupling Amplification SPA.1841 (2) 2 GHz SMA 50 Ohm AC x100 (40 dB) SPA.1801 (2) 2 GHz SMA 50 Ohm AC x10 (20 dB) SPA.1601 (2) 500 MHz BNC 50 Ohm DC x10 (20 dB) Information External Amplifiers with one channel, BNC/SMA female connections on input and output, manually adjustable offset, man- ually switchable settings. An external power supply for 100 to 240 VAC is included. Please be sure to order an adapter cable matching the amplifier connector type and matching the connector type for your A/D card input. Software SBench6 Order no. SBench6 Base version included in delivery. Supports standard mode for one card. SBench6-Pro Professional version for one card: FIFO mode, export/import, calculation functions SBench6-Multi Option multiple cards: Needs SBench6-Pro. Handles multiple synchronized cards in one system. Volume Licenses Please ask Spectrum for details. Software Options Order no. SPc-RServer Remote Server Software Package - LAN remote access for M2i/M3i/M4i/M4x/M2p cards SPc-SCAPP Spectrum’s CUDA Access for Parallel Processing - SDK for direct data transfer between Spectrum card and CUDA GPU. Includes RDMA activation and examples. Signed NDA needed for access. (1) : Just one of the options can be installed on a card at a time. (2) : Third party product with warranty differing from our export conditions. No volume rebate possible. Technical changes and printing errors possible SBench, digitizerNETBOX and generatorNETBOX are registered trademarks of Spectrum Instrumentation GmbH. Microsoft, Visual C++, Windows, Windows 98, Windows NT, Window 2000, Windows XP, Windows Vista, Windows 7, Windows 8 and Windows 10 are trademarks/registered trademarks of Microsoft Corporation. LabVIEW, DASYLab, Diadem and LabWindows/CVI are trademarks/registered trademarks of National Instruments Corporation. MATLAB is a trademark/registered trademark of The Mathworks, Inc. Delphi and C++Builder are trademarks/registered trademarks of Embarcadero Technologies, Inc. Keysight VEE, VEE Pro and VEE OneLab are trademarks/registered trademarks of Keysight Technologies, Inc. FlexPro is a registered trademark of Weisang GmbH & Co. KG. PCIe, PCI Express and PCI-X and PCI-SIG are trademarks of PCI-SIG. LXI is a registered trademark of the LXI Consortium. PICMG and CompactPCI are trademarks of the PCI Industrial Computation Manufacturers Group. Oracle and Java are registered trademarks of Oracle and/or its affiliates. Intel and Intel Xeon are trademarks or registered trademarks of Intel Corporation. AMD and Opteron are trademarks or registered trademarks of Advanced Micro Devices. NVIDIA, CUDA, GeForce, Quadro and Tesla are trademarks/registered trademarks of NVIDIA Corporation.